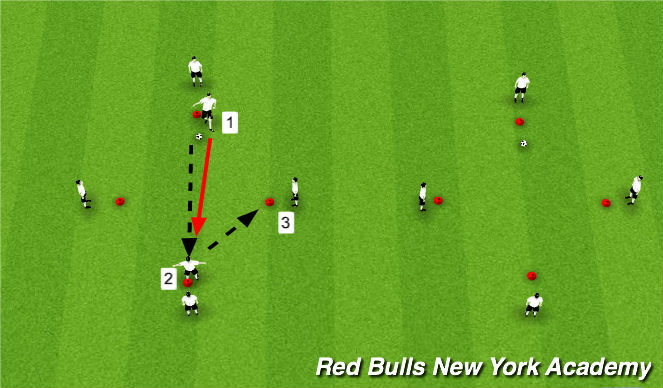 - Red attacker passes to other red attacker who must start at other side of square then joins in to make a 2 v 2 situation. - As ball travels first defender approches attacker and must try to defend target goal by showing attacker inside and away from goals. - 2nd defender takes up support position to assist 1st defender and prevent attacker to pass or run ball into space behind or 2nd target. -****Must be aware also of 2nd striker and try to find supporting position which could promote intersections and allows him to press 2nd striker if he receives the ball. 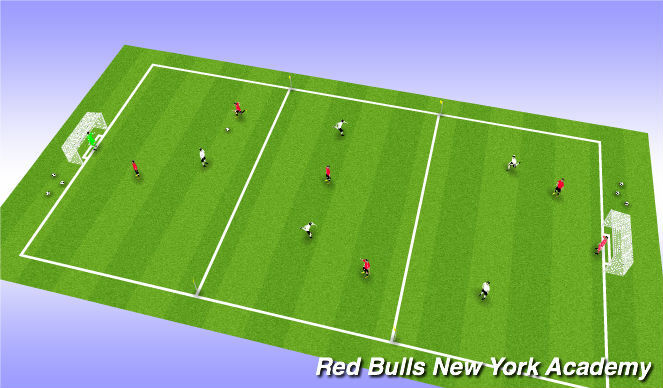 - Both defenders must try to stop ball from being passed into targets. - All players rotate after attack. - Players must committ and communicate their roles, 1st defender ("I got ball! "), 2nd defender should QUICKLY take up the role. Put time limit on attack.